The Parliament of England voted against the Brexit deal. And as we can see, the collapse did not happen. 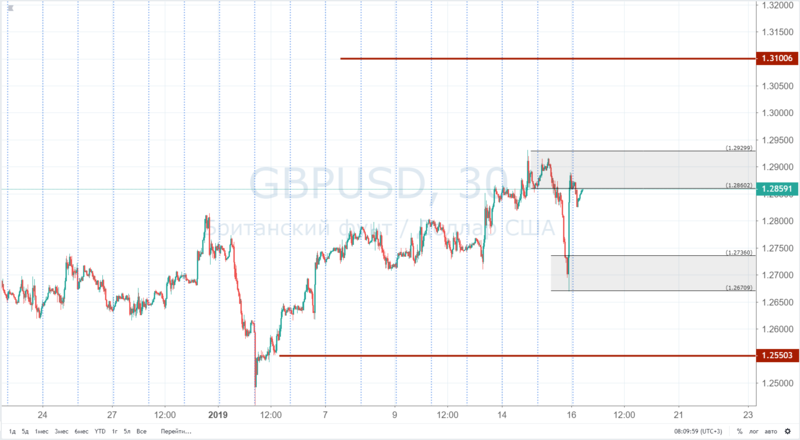 The pair GBPUSD dived down quite strongly, but in the price range of 1.2736-1.2670 the price met strong support, and we can assume that there is some activity of buyers in this range. Let's say that it makes sense to talk about the continuation of the decline in the currency pair only after the breakdown of this range. In the meantime, everything looks like a false breakdown, after which steady growth may occur. And the growth does not represent current economic situation. The fact is that after the failed parliamentary vote on the terms of the Brexit deal, a procedure was initiated to introduce a vote of no confidence in Teresa May and the entire government. And today at 22:00 Moscow time, a vote will be held on it. And, if it proves successful, the government must resign. And these are new elections, new terms, uncertainty, and, as a result, a decline in the economy and, accordingly, in the national currency. Although it should not be ruled out that all the negative consequences already reflected in the price. And you won't have to wait for a big fall. But we do not know this, it is important for us to follow the development of the situation and the technical picture, which can tell who exactly is power in the market now. During yesterday's trading session, we saw a breakdown of the 2600 price mark. At the time of the breakdown there were signs of a false breakdown, but for the time being we’ll omit them. Suppose that the market structure of an upward trend is found. Select the price range of 2600-2560 as support. 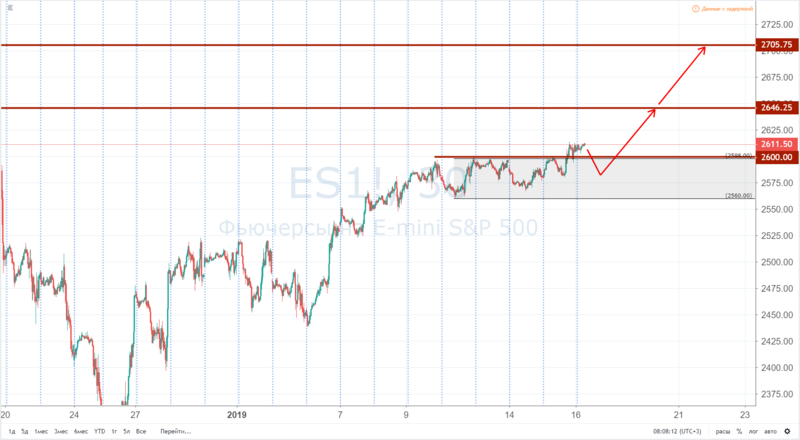 The emergence of prices below 2560 will speak about the termination of the trend structure, and the levels of 2646 and 2705 will be our targets. It would not be bad if the index growth was supported by fundamental components. We remind you that the reporting season of American companies has begun, the suspension of the work of the government in the United States continues, and there are still many uncertainties on the part of the so-called trade wars between the United States and China. Of all these areas, positive news may arrive, which will give impetus to the growth of the index. Do you want to practice and test the analyst's assumptions? Open a demo account in ARUM Capital! If you are confident in your abilities and consider the risks, you can open a real account for trading. Care. The provided market analysis materials are a professional opinion of an associate of ARUM CAPITAL. These materials are provided for infomation purposes only. In no way can the provided analysis be considered as an action signal, neither is it any sort of investment advice (for the purposes of EU Directive 2004/39/EC). ARUM CAPITAL waives any liability for the trading results which may arise after using these reviews. These materials contain NO warranties or guarantees, either direct or implicit, on the precise, complete or confirmed character of the details they contain.